Need help with t:connect or your pump? You've come to the right spot. Select a topic to get more information on. Get a more complete view of your therapy and upload your BG meter data to t:connect. Add a BG meter any time by visiting the Settings section and click the Add a BG meter button (or just click the button above). Saving your reports as a PDF is a just a click away, with the Save PDF button. Press the down arrow on the button for two additional options. 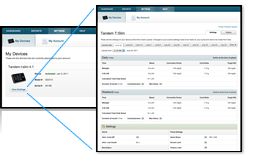 Select Custom Report to specify the additional information you want to be included in the report such as the data table, notes or blood glucose summaries. Use Export Data to open your data in Excel or other applications in CSV (Comma Separated Values) format. Need to annotate a blood glucose reading? 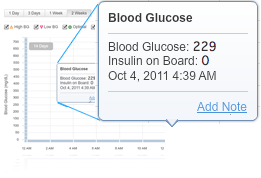 Click on the blood glucose reading dot and press the Add Note to remind yourself why your BG got a little high. Your pump settings can be accessed by clicking on Settings > My Devices and clicking on the picture of your pump. A snapshot of your pump settings are captured every time you upload your pump's data allowing you to see both your most recent as well as past pump settings. Want to know how often you've been changing your cannula for any given period, just take a look at the bottom of the dashboard. You'll not only find site and cannula information, but cartridge and tubing maintenence as well. See the levels of insulin that remain in your body or Insulin On Board (IOB) by selecting the Insulin On Board checkbox on the Therapy Timeline Reports.